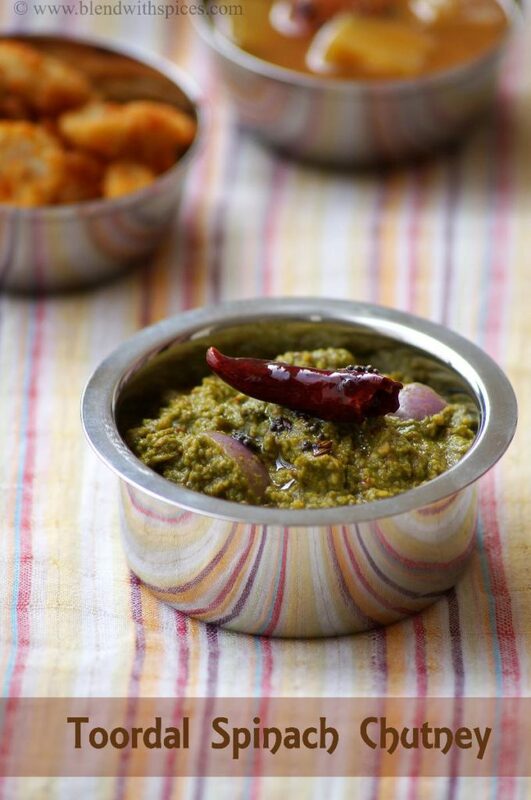 If you are searching for more Chutney Recipes then do check Red Chutney, Bottle Gourd Chutney, Mint Peanut Chutney, Peanut Onion Chutney, Peanut Tomato Chutney, Snake Gourd Sesame Chutney, Kobbari Kothimeera Pachadi and Chukkakura Tomato Pachadi. Heat a teaspoon of oil in a heavy bottomed pan. Add the toor dal and roast on a low – medium flame till light brown color and you get a nice aroma. Then add cumin seeds to it and roast for a few seconds. In the same pan, add the red chillies and fry them for a few seconds on low heat. Set them aside. In the same pan, add a teaspoon of oil. Add the washed spinach, turmeric and a pinch of sugar and mix well. Saute until spinach is well cooked. Sprinkle little water if needed. Peel and chop the onion into chunks and set aside. 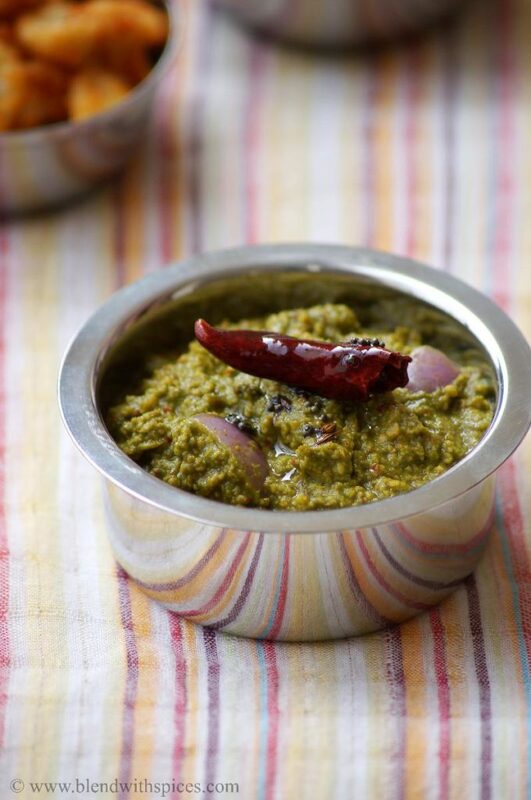 Grind the roasted toor dal, roasted chillies and tamarind into a coarse powder. Add the salt and cooked spinach and grind it to a coarse mixture by adding water little by little. Now add the chopped onion and pulse the mixie for a couple of times. Transfer the chutney into a bowl. Heat a teaspoon of oil in a pan for seasoning. Add the mustard seeds and cumin seeds. Once the seeds start to splutter, add the hing and red chilli. Immediately pour this seasoned ingredients over the chutney and combine well. this is new…looks very interesting. This sounds so good! I'm going to try it out next time. Yum! Please subscribe/ add my email to your mailing list. Thank you.